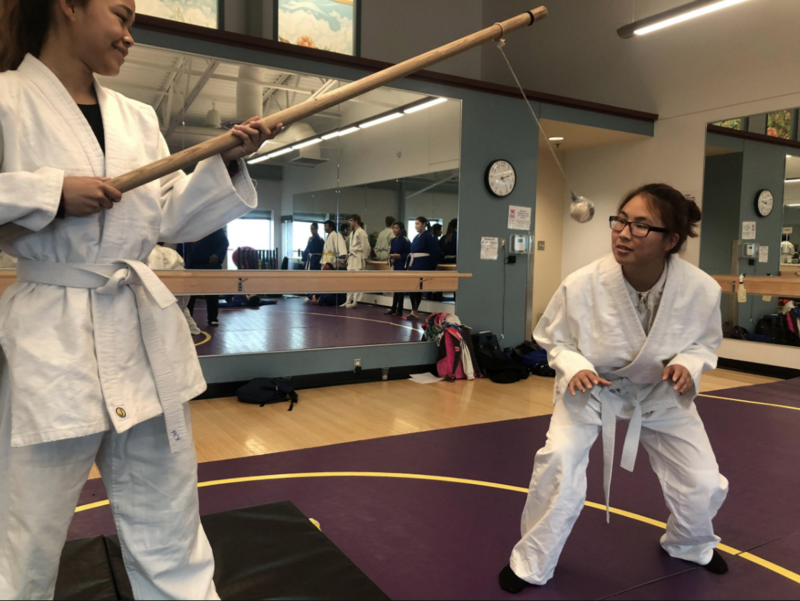 Krista Waskey (left) and Vanessa Hunter (right) practicing their self defense moves in the YK Fitness Center's studio last August. Council is now looking into repairing the room’s bamboo wood flooring. The Bethel City Council says no more stationary cycling in the YK Fitness Center Studio until floor repairs get made. The Parks, Recreation, Aquatic and Health Committee brought the issue to council on Tuesday night, asking for repairs to be made to the studio dance room, typically used for group fitness classes. Bethel City Manager Peter Williams says that over the last few years, the bamboo wood floor has taken a beating and will be expensive to repair. “Five pedal bikes, fitness machines that they pull in there, there’s two legs on those machines that have rubber stoppers or casters on the bottom, and they’ve scuffed up the floor something fierce,” said Williams. The council wants to know if the contractor that runs the center can be held responsible for the cost. It agreed by unanimous vote to have the administration look into the best way to fix the floor. All voted but Leif Albertson, who was absent due to travel.